San Francisco officials on Thursday marked the start of the construction of the suicide-prevention net under the Golden Gate Bridge. Officials say the net will be positioned 20 feet below the sidewalk and extend out another 20 feet. Made of seven football fields worth of stainless steel, the structure will curve up slightly at its ends and be suspended 200 feet above the Pacific Ocean on both sides of the bridge — invisible to drivers. In 2016, 39 people jumped off the Golden Gate Bridge and plunged to their deaths, according to spokeswoman Priya Clemens. But bridge patrol workers were able to prevent an additional 200 people from committing suicide. Democratic Minority Leader Nancy Pelosi and Sen. Dianne Feinstein led the ribbon-cutting ceremony. San Francisco officials will on Thursday mark the start of the construction of the suicide-prevention net under the Golden Gate Bridge. Pete Suratos reports. Kimberly Renee Gamboa held back tears as she remembered her son Kyle, who killed himself at the bridge in 2013. "He was just starting his senior year in high school at Sacramento Waldorf School," an emotional Gamboa said, pausing while she gathered her breath. "It doesn't just happen to the family. It happens to every single person he knew." Three-and-a-half years later, Gamboa joined federal and state leaders at Thursday's festivities, which also included a planting ceremony near the bridge. "Today we are here to observe a labor of love," Pelosi said. The California Highway Patrol has been tasked with managing traffic during construction. The agency will be paid for opening and closing designated lanes at night, when the bulk of the work is expected to occur. The construction is scheduled for nighttime when fewer cars are on the road. First approved in 2014, the nearly $200 million project has been delayed due to years of debate and its hefty price tag. Contractor fencing to protect workers will go up in early May, and net installation is set to begin mid-2018. 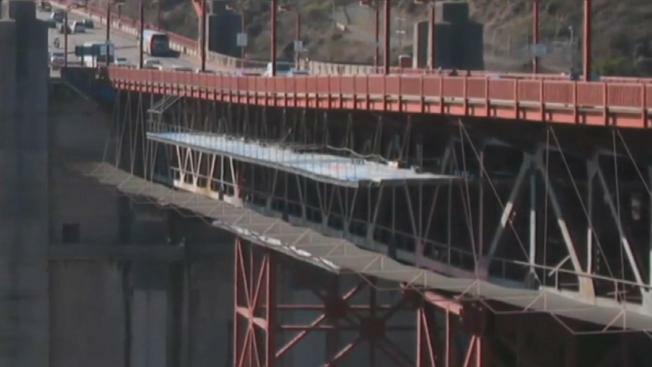 The Golden Gate Bridge, Highway and Transportation District's Board of Directors on Friday approved two contracts related to the proposed suicide prevention net. Christie Smith reports. NBC Bay Area's Laura Malpert contributed to this report.